Welcome to this week’s Movie Gallery giveaway contest! The prizes from last week’s Death Proof Prize Pack Giveaway have been sent off to the bright contestant who answered the trivia question correctly, and now we turn our attention to the present. 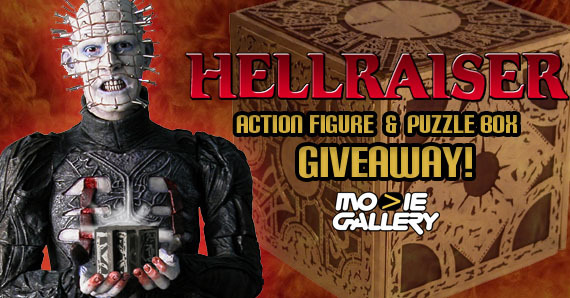 This week’s creepy prizes come from Hellbound: Hellraiser II! The second film in the now famous Hellraiser series, the movie revisits the world of the Cenobites, an otherworldly race often mistaken for angels & demons, who dole out sadomasochistic torments to those who seek deranged pleasure on our world. Continue on to learn how you can win an action figure of the chief Cenobite, Pinhead, as well as a recreation of one of the puzzle boxes that act as portals between our world and that of the twisted Cenobites! Based on the grisly Clive Barker horror classic! Hellbound Pinhead features a movie-accurate sculpt and articulation. He comes with a Lament Configuration Box and a piece of the Pillar of Souls. 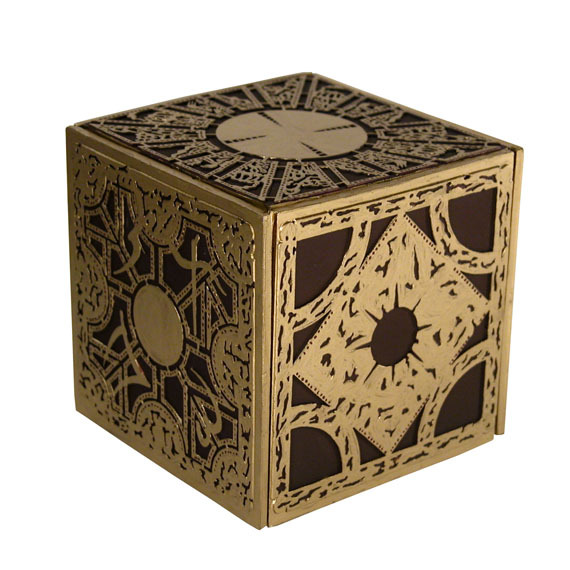 Based on the actual puzzle box seen in the Hellraiser movies! The six pieces assemble easily to form a full-scale Lament Configuration puzzle box. Measures 3.25″ square, durable painted plastic. Doorway to an alternate dimension of unspeakable pain may or may not open. This entry was posted in Contests & Giveaways and tagged clive barker, giveaways, hellraiser by mgadmin. Bookmark the permalink.